Dehydrated oily skin is like Goldilocks- it can't have too much or too little, everything has to be juuust right. Too much hydration results in oily t-zones and possible acne, while too little results in tight, dry skin everywhere. I'm not the biggest fan of creams and lotions because they often provide too much moisture, so lately I've been using the Troiareuke Skin Complex Formula to give my skin the right amount of hydration it needs. 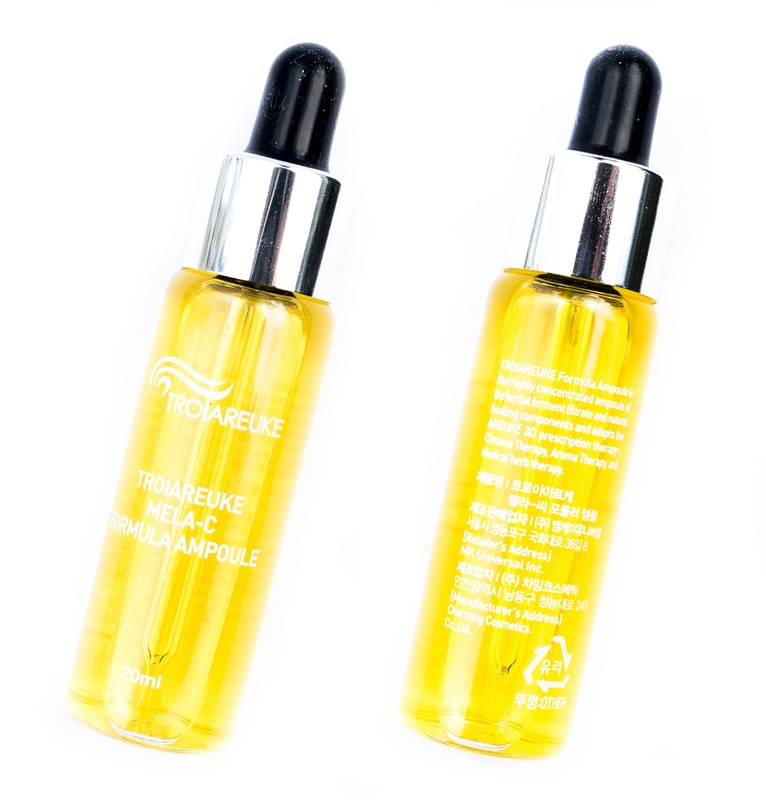 Since post inflammatory hyperpigmentation (PIH) is also a huge concern of mine, I've paired it with the Troiareuke Mela C Formula Ampoule to tackle two problems at once. This combination was part of the skincare "prescription" given to me by Troiareuke when I told them my skin type and concerns. Since they're not really known internationally, here's a short introduction to the brand: Pronounced troy-ARE-keh, Troiareuke was originally a spa brand in Korea that decided to make their products available to the public after launching 6 years ago. Their products are formulated based upon scientific research as well as knowledge from one-on-one interactions with clients at thousands of spas. I was really excited to give their products a try after I found that they're devoted to creating effective and gentle products for every skin type. As someone with sensitive and acne-prone skin, I'm always on the lookout for gentle formulations that also deliver results. And Troiareuke is definitely one of them. What Is It: A hydrating toner to be used after cleansing and actives (if you use any). Can also be used as a facial mist anytime. Size: 180ml | 6.08 fl. oz. According to CosDNA, there is only one low potential acne trigger, which is butylene glycol. I do want to note however that this is an ingredient that appears in most skincare products, and I've personally never had a problem with it, so it's not going to make most people breakout. However if you are sensitive to this ingredient or have known sensitivities to any of the other ingredients listed above, don't use this product. 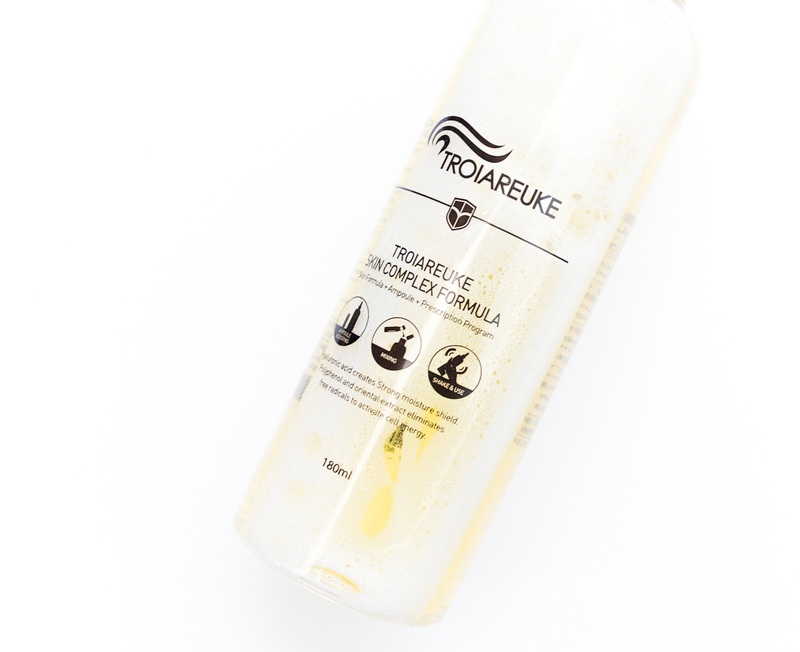 Troiareuke highlights hyaluronic acid as one of main ingredient in this toner, but what they have listed is actually sodium hyaluronate. What's the difference between the two? Sodium hyaluronate is a water-soluble salt form of hyaluronic acid. It's more stable (less likely to oxidize) and has smaller molecules than hyaluronic acid, so it's able to penetrate the skin better. That means it's a more powerful humectant than hyaluronic acid, helping your skin retain more moisture. Two other ingredient highlights are pinus denisflora bark extract (pine bark extract) and salicornia herbacea extract. Pine bark extract is an antioxidant that also protects skin against UVB-induced photoaging (source). Salicornia herbacea extract comes from a type of succulent, and is found to be an potential skin rejuvenating agent that has antioxidant and brightening effects (source). This toner is also full of many other plant and flower extracts- including some that I've never seen before in cosmetics. At first look the one I recognize immediately is calendula flower extract, an anti-inflammatory ingredient rich in antioxidants. Some of the more interesting extracts include japanese pepper fruit extract (antioxidant rich as well) and satsuma mandarin peel extract (anti-inflammatory and antioxidant rich). It seems like many of the extracts are high in antioxidants, which slow down the effect of free radicals on our skin to prevent and repair damaged tissue. This is non-beauty related, but I came across a study that suggests japanese pepper fruit extract can induce cancer cell death (source). There isn't much information on its topical uses, but I wonder if it has a lot of potential as a skincare ingredient? Some other notable ingredients include allantoin (skin soothing and healing), niacinamide (brightens and even outs skin tone), and dipotassium glycyrrhizate (skin-conditioning and anti-irritant). The Skin Complex Formula is packaged in a plastic spray bottle, but I find the spray nozzle a little too strong to spray the toner directly onto my face. Compared to super fine mists (like the Tatcha Dewy Skin Mist), this does not dispense a fine mist at all. It's similar to those $1 spray bottles you'd find at the supermarket- it does its job, but not very well. The only way I can spray it directly onto my face is by holding it at more than half an arm's length away, which I find wastes the product. It's a shame since I think it'd be a wonderful hydrating mist to use throughout the day, so I'm probably going to decant some of it into my Tatcha bottle once I'm done with the Tatcha mist. Although it fails a bit in the packaging area, the Skin Complex Formula makes up for all of it with its formula and results. It's amazingly hydrating yet lightweight, and I find that I can rely on it alone to hydrate my skin. Yes, that's right- for the past four weeks I've been using this alone without any other serums or creams during the day (other than the Mela C Formula Ampoule, which has little hydration) to test how effective the two products actually are. And the result? By layering this three to four times, my dehydrated skin is well-hydrated without the use of any other products. On days where my skin is feeling particularly dry, I may do five layers, but since I do have an oily t-zone, I usually do 3. What I do is simply spray once into the palm of my hand to dispense the product, then pat it evenly onto my face, and repeat this multiple times. It does have a somewhat sticky finish, but once it's fully absorbed I'm just left with hydrated skin that's smooth to the touch. Despite it being so hydrating, it's still very lightweight, so it doesn't feel heavy at all. At night I do like to use a sleeping mask, but I can see myself using this by itself at night in the summer since my skin gets oilier during the warmer seasons. Also, despite using this product so much, it looks like I've used up about a quarter of it in a month and half, so a whole bottle can last around 4-6 months depending on how often you use it. What Is It: A skin brightening ampoule that can be used all over the face and as a spot treatment. Size: 20ml | 0.676 fl. oz. 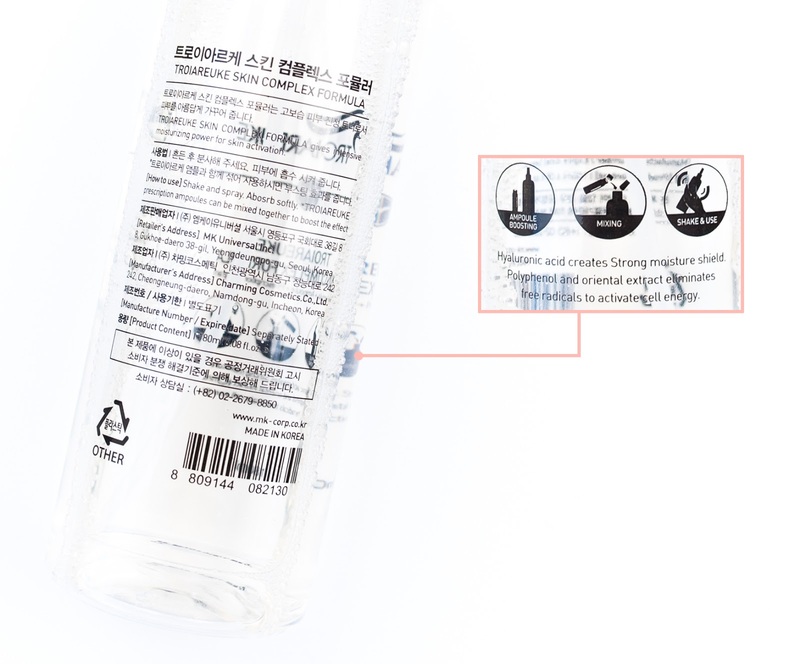 According to CosDNA, the only low potential acne trigger is butylene glycol as well in this ampoule. This does contain alcohol, but I personally don't have a problem with alcohol in cosmetics as long as it's in small amounts. However if you are sensitive to alcohol or any of the other ingredients listed, then don't use this product. This ampoule is also full of plant extracts, but since I'm seeing some ingredient overlap with the Skin Complex Formula, I'm just going to focus on the key ingredients in this ampoule. 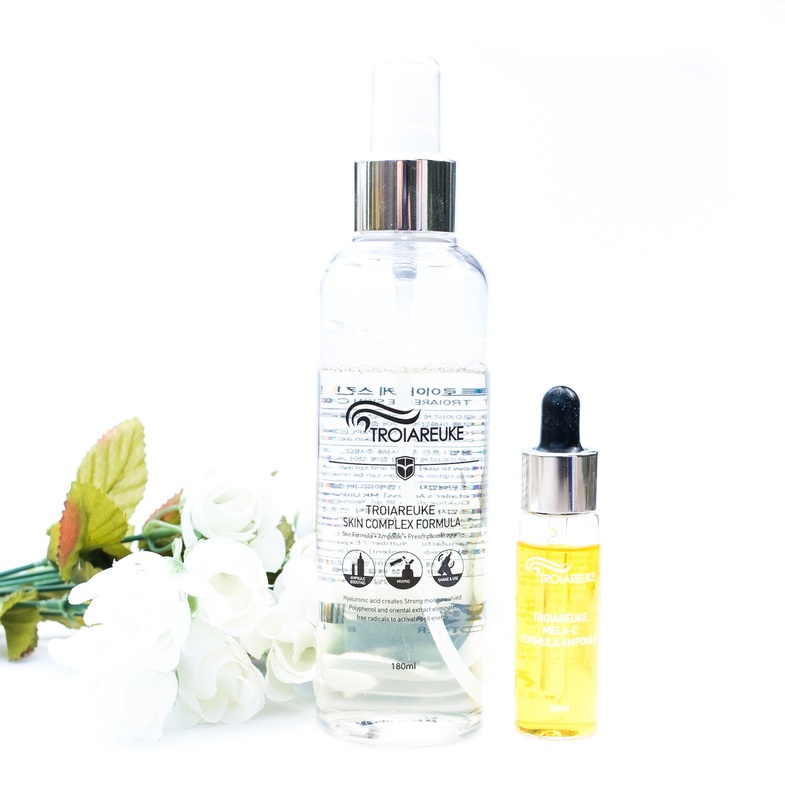 First off are the ingredients that make this ampoule what it is: niacinamide and arbutin, two well known ingredients for skin brightening and whitening. While niacinamide can lighten areas of pigmentation and even out skin tone, arbutin reduces melanin production to lighten your skin tone. Another ingredient to note is green tea extract, which is an antioxidant and has skin soothing properties. This product also contains soybean phytoplacenta extract, which is an antioxidant and anti-aging ingredient that has comparable effects to retinoid, but can be used during the daytime (source). It also has the ability to reduce hyperpigmentation and is anticarcinogenic (source). The Mela C Formula Ampoule comes in a glass bottle with a dropper. Texture- and appearance-wise, it's pretty much like colored water. It doesn't feel particularly hydrating, and it's fairly easy to spread when used on its own. It absorbs quickly and doesn't have any sort of finish. There is a slight scent to it, but it's so faint that it's almost undetectable. I was told to mix about 3/4 of the ampoule into the toner, and use the remainder of the ampoule as a spot treatment. However, what I decided to do instead was to use the ampoule all over my face the first week, and then use it as I was instructed to the following three weeks. I'm not sure if that actually helped with anything since brightening effects take time to see, but you'd get the same results using it alone vs. using it mixed + as spot treamtent probably. I didn't trust myself pouring the ampoule into the toner since I actually knocked the ampoule over while I was taking photos (I was having one of those clumsy days), so I used the dropper to add it into the toner. And here is how it looks mixed! Since the ampoule is quite pigmented, it turned the Skin Complex Formula into a light but still bright yellow. Other than the color though, nothing else changed. So how effective was this combination at reducing my PIH? Well, in four weeks time, I've definitely seen quite a bit of improvement in my acne scars. Prior to trying out these two products, I had used my Curology prescription for months and it never really did anything for my scarring despite containing 4% niacinamide. But with this, I saw results in just one month. Granted it's nothing drastic, but the spots are definitely fading and some are almost completely gone. When it comes to PIH, I've learned that it takes lots of time (I'm talking months or even a year) and patience for it to disappear, so I'm pleased that the ampoule was able to speed up the process. During the time I used these two products, I got a few pimples due to a makeup base I tried out. Normally those pimples would've left pigmented scars that'd take forever to go away cause I squeezed some of them (I know, I really shouldn't be doing that), but amazingly the scars they left behind were gone in less than a week. The pictures don't show it too well, but I've also noticed that my skin tone has lightened slightly since I started using this combination. By no means am I saying it bleached my skin, it just sped up the process of fading my tan and returning my skin to its natural color. My skin also looks brighter now, so I'm definitely happy with the results! I wasn't expecting much because brightening products normally don't do much for my skin, and if they do it's very temporary, but I can tell that the Mela C Formula Ampoule has a permanent brightening effect and does its job at fading hyperpigmentation. Overall, I would highly recommend the Skin Complex Formula for all skin types, and the Mela C Formula Ampoule for those looking to brighten their skin and fade hyperpigmentation. I never had any irritations or breakouts from using these two products, so those with acne-prone and sensitive skin should be fine with them. In fact, most hydrating toners (especially those that have that "slip" to them), end up being too heavy for my skin and cause me to break out, but this one didn't. I think anyone could benefit from the Skin Complex Formula, even those with oily skin. 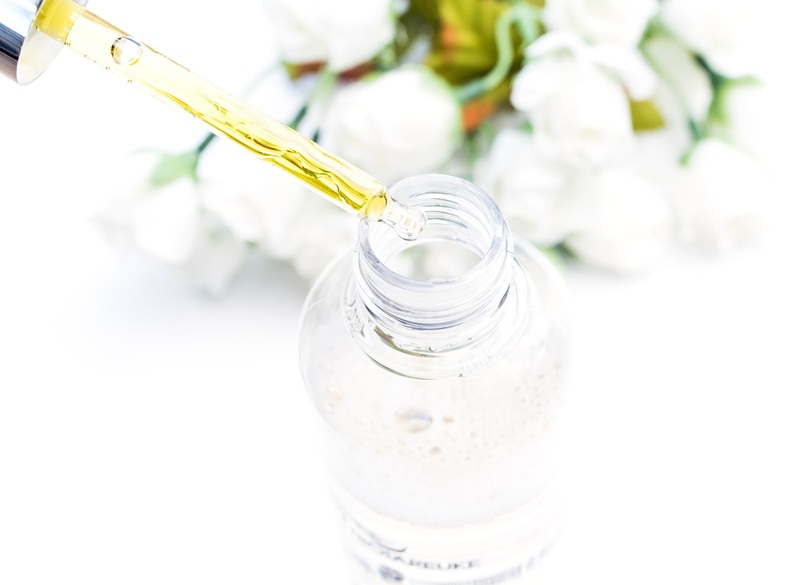 If you have oily skin you could probably rely on it alone to hydrate your skin since it won't make your skin oilier (as long as you apply the right amount), and those with dry skin could use this to add an extra boost of hydration to their routine. As for the Mela C Formula Ampoule, it's a very gentle but effective brightening product so any skin type can use it as well. What do you think of these two Troiareuke products? Let me know in the comments below! *Disclaimer: The products featured were sent to me for review purposes by Troiareuke. All opinions are mine and 100% honest.